Dear friends, I wanted to visit this monument since I can remember, but it was never its turn, until this year when we went to Romania especially to see it. Sarmizegetusa Regia was the capital and the political and religious centre of the Dacians prior to the Roman conquest. Build on top of a 1200 metres high mountain, Sarmizegetusa Regia is part of a chain of six fortresses, the Dacian strategic defence system in the Orăștie Mountains. It is not to be confused with Ulpia Traiana Sarmizegetusa, the Roman capital built by Emperor Traian after he concurred Dacia. For me it was important to know that part of history since I've discovered so many times that what we've learned at history in school was a little altered. I wanted to see, to feel for myself and I was not disappointed. 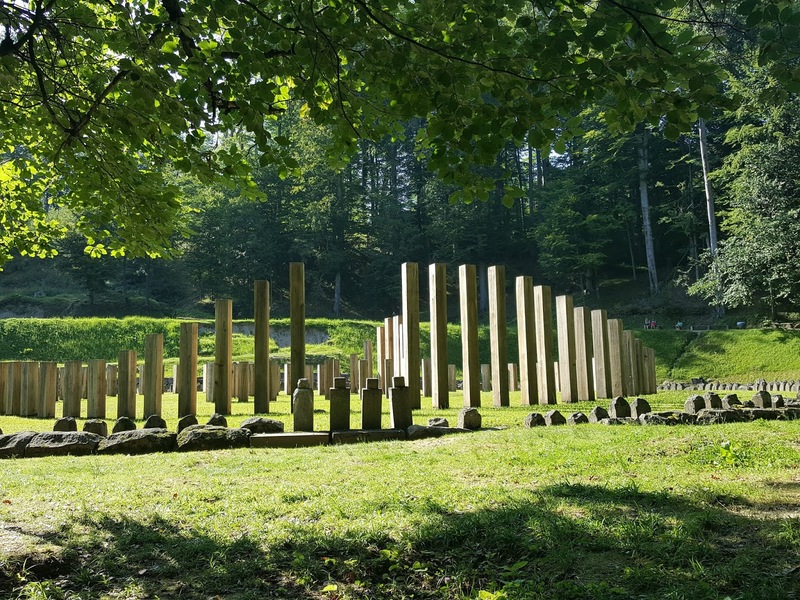 Word of advice though, go to Sarmizegetusa Regia with your lesson learned and time to spare and try to visit all six fortresses and Traian's capital. We went on a hurry, but for sure in this lifetime I will be back. Legend says that the archaeological site was altered by a Romanian movie filmed in the area, part of the communistic propaganda concerning our history. For me the site was impressive and I am glad I visited it. I could not pinpoint what was real and what was build up by the film crew, but the area has a specific energy. I wanted so badly to reach the site that I almost run the last two kilometres which are to be walked to the site from the parking so when I arrived I found the first free bench and had a glucose reduction and almost fainted. I wanted so badly to have water, but unfortunately drank it all on our way, but as a miracle there is a spring of water in the middle of the archaeological site. With my powers back I visited the whole site and spent almost three hours watching and taking all in. The most relevant connection I could make was with Newgrange in Ireland. In my mind the structure in Sarmizegetusa looked similar to what I saw in Ireland. I might be wrong, but I've already said it, I have to read more and go back more informed about Dacians. Everything is connected, the fact that I've ended up in Ireland, that I'm Romanian and that I now live in Arlonia. For me Dacii (Dacians) are from legends, so being able to touch something they created was surreal. It was the prove that they existed and that at one point in time, we were someone. Romania has such a tormented history and as a migrant I feel the need to connect to something real, to be able to be proud of my origins. 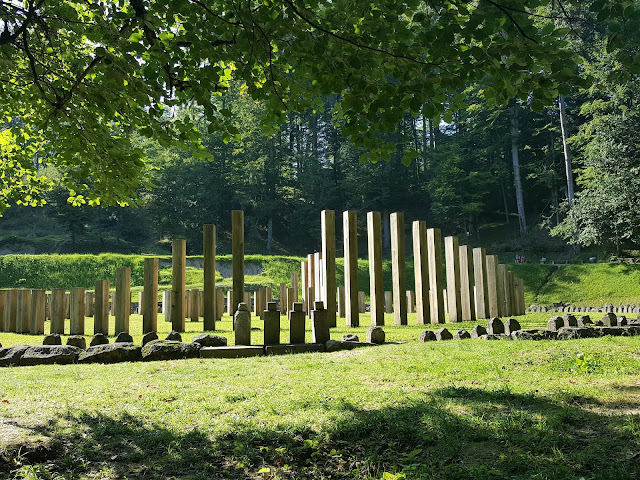 I felt that proudness in Sarmizegetusa. I felt I was part of something bigger that is only revealed to me now. I want to read and go back and walk the path between the six monuments and I know that somehow that is going to be possible in the near future. I leave the desire here and I'm sure the universe will listen. For me Sarmizegetusa Regia seemed only as a religious capital, no sight of fortifications, no sight of living structures. It was an adventure, a point in time to be remembered. As it happened I was wearing one of my beloved Romanian Blouses with ram horns, I found a four leaf clover which reassured my connection to Ireland, I was impressed and I want to go back, someday. I hope you loved reading this post as much as I loved putting it together! Also, if you fancy keeping in contact with me, drop a line at Dichisuri.roon Facebook.